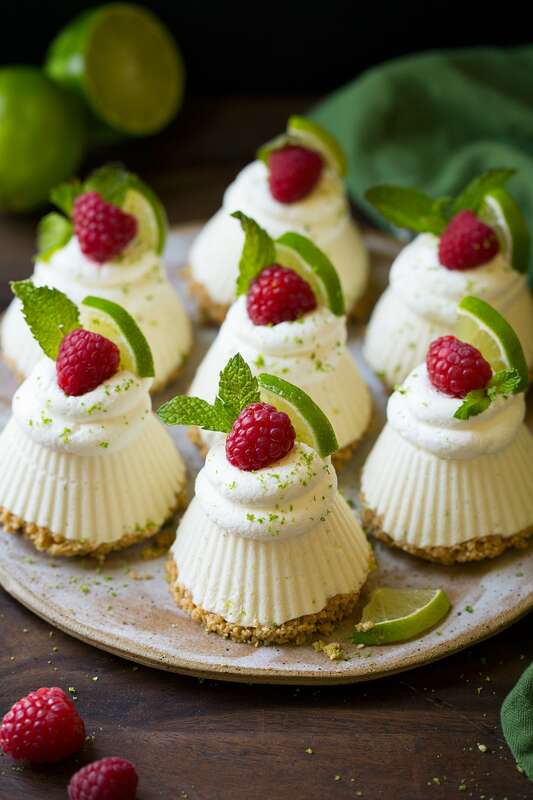 Mini Key Limes Pies are so fun and they’re a simple yet impressive dessert. They’re sweet and tangy and one step away from being ice cream. Plus they have a decadent cheesecake flavor and everyone will love the individual portion size. Where have these little cups of limey deliciousness been all my life? They are perfectly ice cold and so refreshing on a hot sunny day. 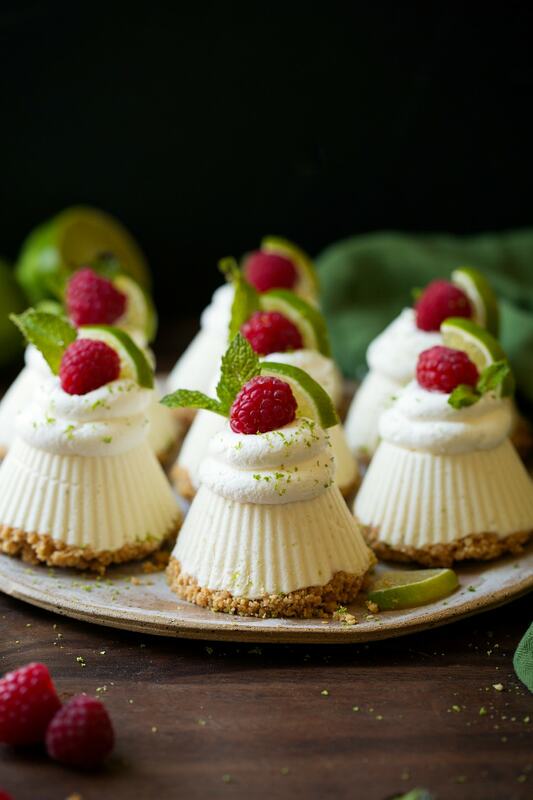 You’ll love the fact that they are no-bake because during those 100 degree summer days we just don’t want to heat the house up with a hot oven. The other great thing about these is that they are a dessert that people of all ages will love. And these little cupcake size pies just look that much fancier than a whole pie does right? Mix graham cracker crumbs with butter and honey. In a bowl whip heavy cream to soft peaks, add 1sugar and whip to stiff peaks. Separately whip cream cheese with 1 Tbsp sugar until fluffy. Mix in condensed milk, lime zest and lime juice. Fold in whipped cream mixture. Divide mixture among silicone liners, filling each within about 1/4-inch of the top. 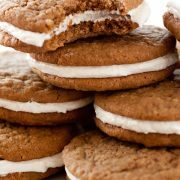 Sprinkle graham cracker mixture over filled cups so you have an even layer over each. Cover loosely with plastic wrap and freeze until firm, about 3 – 4 hours. Remove from liners then top with sweetened whipped cream mixture and garnish. One thing I highly recommend here is silicone cupcake/muffin liners. Just the standard size. I bought some to make these because I’ve made brownie ice cream cupcakes before and they just stuck and were a total disaster so this time around I didn’t want to deal with any sticking. I’m guessing after a few minutes of them sitting out they’ll soften up enough you can remove them from paper liners but I just didn’t want to risk it. You can buy the silicone cupcake liners at most craft stores or online (Hobby Lobby, Michaels, Amazon) and they cost about $5 – $10 and I think they are worth it for frozen cupcakes. These mini pies are so fun, and they're a simple yet impressive dessert. They're sweet and tangy and one step away from being ice cream. Plus they have a decadent cheesecake flavor and everyone will love the individual portion size. Line a 12-cup muffin liner with silicone cupcake liners (you can find these at most craft stores), set aside. Pour graham cracker crumbs into a mixing bowl. Mix together melted butter and honey in a dish. Pour butter mixture over graham cracker crumbs and stir to evenly coat. Set aside. In a mixing bowl whip 1/3 cup heavy cream using an electric hand mixer set on high speed until soft peaks form. Add 1 Tbsp sugar and whip until stiff but not dry peaks form. In a separate mixing bowl whip cream cheese with 1 Tbsp sugar using mixer set on medium-high speed until light and fluffy, about 2 minutes. 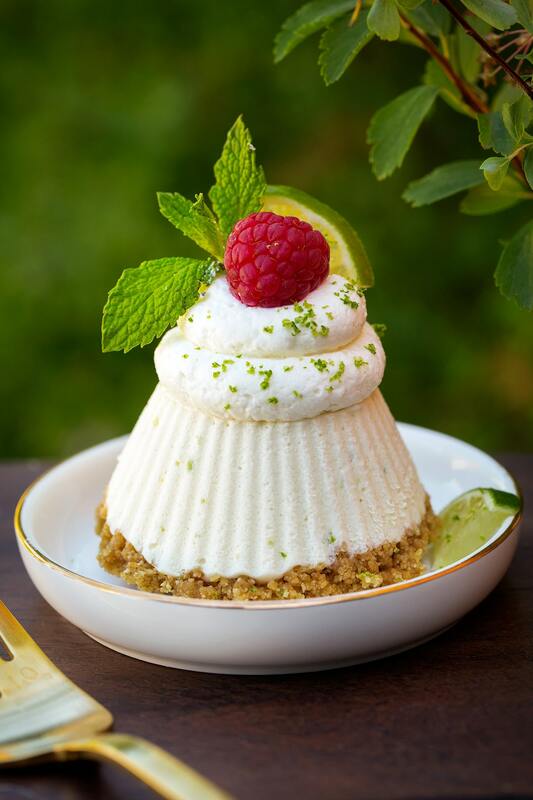 Mix in condensed milk then blend in lime zest and lime juice. Fold in whipped cream mixture. Divide mixture among silicone liners, filling each within about 1/4-inch of the top. Sprinkle graham cracker mixture over filled cups so you have an even layer over each. Cover loosely with plastic wrap and freeze until firm, about 3 - 4 hours. For the topping whip heavy cream in a mixing bowl using an electric hand mixer until soft peaks form. Add in sugar and whip until stiff peaks form. Transfer to a piping bag fitted with a small round tip (or mixture can be spooned over as well). Remove cups from freezer when ready to serve, remove from liners then turn pies so crust layer is on bottom. 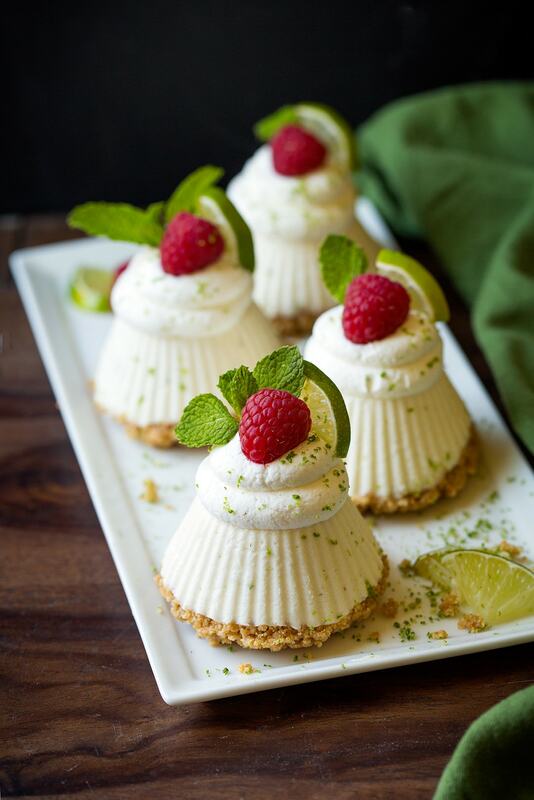 Pipe whipped cream over top, garnish each with a raspberry, lime wedge, mint and lime zest if desired. 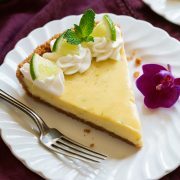 Of course key lime juice and zest can be used here as well. I just don't think there's a big flavor difference so to me it's not worth juicing all those tiny key limes so I just stick with the regular size limes. 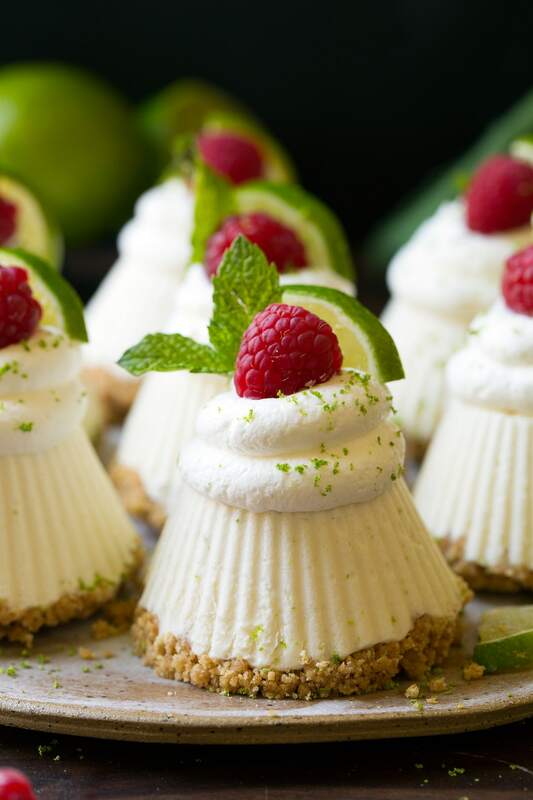 Linda: I really enjoyed these key lime mini frozen pies. I live in Canada and was wondering if the measurements are imperial or do I need to adjust the amount of sweetened condensed milk? 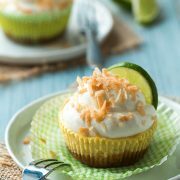 Also do you have an orange version of this recipe, my wonderful husband thinks lime is like eating glade room freshener.